Click on the map and you can get information on each of the parking garages. Queen Mary for Overnight parking! WHAT ARE THE PARKING RATES FOR THE QUEEN MARY? Parking rates are subject to change during special events. For a list of event, dates click here. See more options on the city’s parking site: https://www.parklb.com/! We are on the Passport bus route and will also have a free bike valet at the event. 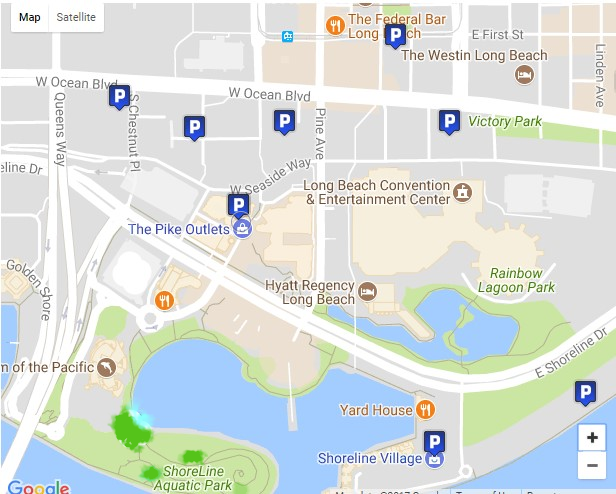 The Pike Parking Lot (95 S. Pine Ave., Long Beach, CA 90802), Aquarium of the Pacific ( 99 Aquarium Way, Long Beach, CA 90802), and Shoreline Village ( 401-435 Shoreline Village Dr. Long Beach, CA 90802) for now. RV Parking Available, walking distance of Shoreline Village. Water Taxi will shuttle you to and from Shoreline Village, to Pirate Invasion, for free. There will also be pirate entertainment at Shoreline Village throughout the day. Golden Shore RV park, located adjacent to Shoreline Village. Rates are for up to 4 people per site. Must be at least 10 years old to stay at the RV park. Deposit of first nights stay required to reserve your spot for the weekend.